Thank you for buying a KODIAK KW-1 kit. This kit contains all that you need to plumb a bait tank, along with instructions on how to build a variety of tanks, from an inexpensive recycled tank to tanks rivaling the best factory plumbed available. Building your own bait tank is easy, as long as you keep a few basic principles in mind; oxygenation, water flow, and suitability of the container. There are basically two types of live bait tanks. Ones that are closed systems and only aerate the water and ones that provide a continuous flow of raw water from the ocean or lake. The latter is far superior in keeping bait alive for prolonged periods. It not only provides a constant supply of oxygen with the new water but also keeps the water temperature constant, and removes harmful ammonia buildup from fish excretions. It does not produce air bubbles that can become trapped in the fishes' gills. Used plastic containers can be recycled into bait tanks, for an extremely economical system. There are hundreds of commercial uses for plastic drums and barrels, which are usually thrown away when empty. Many of them are ideal for conversion to a bait tank. Look for a clean container of a suitable size and shape, and try to find one with a lid. Detachable lids are a plus. They can give you a bigger opening when adding bait, which is helpful when using a large net or a cast net. Now that you have a tank and fittings you will need some additional tools; hole saws, 1 7/8" for the main drain, 7/8' for the 90 degree inlet and end of day drain, (if unavailable you can use a sharp knife or router, with extreme caution), and a tube of marine grade sealant such as Rule Elastomatic, Boat Life, or an equivalent. FORGET USING SILICON, IT WILL NOT LAST UNDER CONSTANT SUBMERSION IN WATER. Proper placement of the fittings is important. 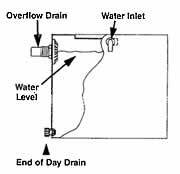 The 11/2 overflow drain should be located at least 21/2 " below the top of your tank to keep slosh to a minimum. If you are able to obtain only a large tank and don't want to use its full capacity, mount the overflow at a point where the water level meets your requirements. Keep in mind that if you are going to drain the overflow thru a hose over your transom, the overflow outlet must be higher than your transom, water does not flow uphill. Make sure that there is some fall in the drain hose. If you are going to install a thru hull fitting for the drain hose it must be above the boats water line for proper drainage. Drill a 17/8" hole for the drain, and apply a liberal amount of sealant to the inside flange and the nut. Place the drain assembly thru the hole and tighten the nut while holding the filter on the inside of the tank. If after tightening the KW-1 strainer is not tight against the tank wall tighten the 3 nylon screws that hold it to the thru hull. Do not over tighten! Do not turn the filter screen while tightening. You may sheer the nylon screws off, use the nut. Install the "end of day" drain as close to the bottom of the tank as possible. Pay attention that there are no corners or anything that will not allow the inside flange nut to lay flat. Apply sealant to both sides of this fitting. The fresh water inlet can be mounted at the top of your tank or close to the bottom. At KODIAK we believe the best way to introduce water is about 1" above the water line. The benefits include allowing debris to settle to the bottom, and reducing turbulence. Some may argue that if you put water in at the top and it comes out at the top, the bottom will remain stagnant. This is not the case. The water will still circulate thru out the entire water column. A look at most large scale aquariums such as those at SEA WORLD will show that they introduce water at or above the water line for the above mentioned reasons. The 1/2 " elbow is provided in your kit to divert the water inlet stream so the water does not shoot across the tank. When in position it should point so the water circulates in a counter clockwise manner. Most bait fish that naturally school will swim in a clockwise manner in the Northern Hemisphere. This will help give them direction to swim and increase water over their gills. A good location for it is 90 degrees from the main drain or on either end of a oblong tank. If you choose to position your inlet low, stay at least 5" off the bottom. Inlets that are placed too close to the bottom will stir up debris such as dead bait, scales and excretions that would naturally settle to the bottom. Long inlet pipes with multiple holes drilled in them do more harm than good. Bait has a tendency to run into them. If the flow is pointed toward the center of the tank it will create turbulence, tiring the bait, and stripping off scales. The best tank design is the one with as few obstructions for bait to run into as possible. Mounting your tank in a manner which prevents movement while under way or in rough seas is important. Besides the inconvenience of having a tank full of water and live bait spilling on to your floor there is also the safety factor to consider. Generally speaking, your bait will get the best ride when located toward your transom. This is the area that gets the least bounce. Before permanently mounting the tank I suggest that you test your boats performance with the extra weight in the area you have chosen. This can be accomplished by either having a friend or friends of suitable size sit in this area, or if safe fill up the tank you plan on using and locate it in the chosen area. Remember water weighs 8 pounds per gallon. If you plan to mount your tank on a swim step or in the rear of your boat try backing down hard to see if the extra weight will make your transom have a submarine effect. If your boat has a tendency to ride bow up or heel due to the extra weight, trim tabs can help but should not have to be applied in excess. Mounting on a swim step or platform can be accomplished easily by screwing thru the bottom of the tank into the step or platform. Mounting inside the boat is generally done by using straps around the can, which are attached to a solid surface on the boat. Drilling thru the tank into the floor or into mounting hardware is not recommended inside the boat, due to the possibility of leakage. Even the best sealant will eventually leak. Forget trying to use glue or adhesives on your tank as almost all plastic cans and containers are made of UHMW high density polyethylene and nothing will stick to it. There is a product called SCOOT GUARD that is sold in most marine stores that can be put under the tank to prevent it from sliding on an uncarpeted deck. SCOOT GUARD is a rubber mat material that is sold by the foot and does what it's name implies. The following section may give you some additional ideas for plumbing your tank. Mounting the overflow drain 21/2" or more from the top as suggested above and cutting a hole not larger than 12" in diameter in your top will help reduce slosh and keep water in your tank and off your deck. Installing a splash guard to the top lid of your tank will help even more. A small waste basket or plastic floral pot works well for this. Look for one about 12" in diameter with a lip around the top. The lip will prevent it from sliding into your tank. Take the small can and with a tape, measure and mark approximately 21/2" to 3" from the top. Next use a heavy scissors or sheet metal shears and cut the can in half following the marks you have made, discard the lower half. Now lay the small can on top of the lid of your tank and draw a circle around it, cut out 1/4 " inside the circle you have drawn. The small can should slip in all the way to the lip and then stop. To keep it in place drill 3 holes thru the small can just inside the lid of your tank. Screw in 3 #6 sheet metal screws to keep the splash guard from falling out. Most bait tanks are plumbed for one water level, it is possible to plumb the tank for dual capacity as well. This will allow you to reduce weight, and conserve fuel when you have less bait. This is a very easy process to accomplish. 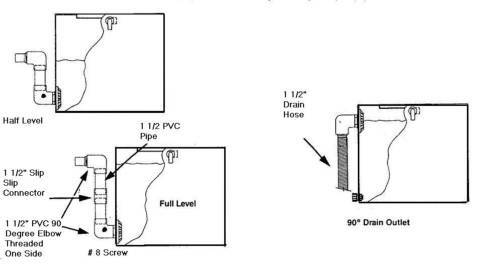 In addition to your KW-1 plumbing kit you will need 2 of 11/2 " PVC 90 degree elbow with threads on one side, a length of 11/2 PVC pipe and 1 of a 11/2 PVC slip connector. Install the KW-1 drain as a close to the bottom as possible. After the nut is tightened up get a hack saw and cut the fitting in half. The cut should be made exactly in the middle of the threads that are showing, as shown. Screw one of the elbows onto each end. The one on the tank should be pointing up. Water test the tank, to make sure you are satisfied with both levels. Make sure that the lower level of your tank will flow over your transom if you are draining it this way. 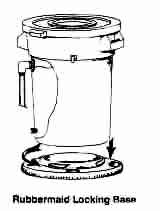 To lower the water level; release water thru the end of day drain until it is even with the center of the slip/slip connector. Remove the top elbow, top pipe and center connector, then reattach the top elbow only to the lower pipe. Make any changes to the length of the pipes if necessary. The bottom pipe will be permanent, so it is a good idea to glue it to the bottom elbow. Do not glue any other connections, they must slip apart to remove the top pipe and reinsert the top elbow into the lower pipe. To prevent the bottom elbow from rotating on the drain fitting thread, drill thru the elbow and the thread of the main drain, then screw in a #8 sheet metal screw. Put sealant over the screw. You may prefer that your main 11/211 drain hose run down the outside of the tank. In addition to the KW-1 kit you need 1 PVC fitting, 11/2 " 90 degree female threaded both ends. After installing the top drain per instructions, cut the thread in half as described in making a half drain tank. Save the cut piece. Screw the 90 degree fitting onto the tank pointing down, then screw the cut piece into the 90 degree fitting. Remember to wrap Teflon tape around both threads. Slip the hose onto the end, securing with a hose clamp. It will run parallel to the tank as shown. Some provisions should be made for supplying light to your bait tank at night. Bait kept in total darkness will not last long. If the bait fish are unable to see they will crash into each other and the walls of the tank, causing injury and early death. The more bait in the tank, the bigger the problem. If the tank you are using has a concave bottom you may be able to put a small light under the tank. If the tank is not too thick the light will shine thru. TRUCK-LITE company makes one, part #10202-C that is 21/2 " in diameter by 3/4" thick, it draws only.33 amps and puts out 2 candle power. It can be purchased at most auto truck parts stores. Now that you have them you want to keep your bait fish happy and healthy. You have a great bait tank, that's a good start here are a few suggestions that should help keep your bait alive longer. Proper flow is imperative to the survival of your bait. Too little and the impurities build up and the bait is starved for oxygen, too much and the turbulence causes the bait to die from exhaustion or scale loss. The time it takes for the tank to fill with water (starting from empty) is called fill time. This should generally be between 6 to 10 minutes. A fill time of less than 6 minutes indicates that the flow is too great, and the bait must work too hard to swim, reducing its lifespan. A fill time of more than 10 minutes indicates not enough fresh water is coming into the tank to flush out waste and provide enough oxygen to keep your bait healthy. Although flow rate required can vary greatly with the type of bait you are using these guidelines are a good place to start. Don't beat up your bait by going to fast. Even moderate boat speeds across a short wind chop can quickly bruise the bait to the point that picky game fish will ignore you red-nosed or scale less offerings. Don't over crowd your bait tank. One of the major causes of premature death in bait fish is that people put too many fish in a tank. If you are catching your own bait versus buying pre caught bait you will generally be able to put more in a tank because the bait will be in better shape, really slimy and healthy. The number of bait fish your tank can support will vary depending on the type of bait you are using and the time of year, i.e. water temperature. You will learn to judge this for your self. More is not always better! removing bait from the tank using a bait net avoid digging into the tank, this will injure a lot of bait. If transferring bait from one container to another use a bucket. This will reduce scale loss caused by the net. If dead fish settle to the bottom of the tank, remove them and use them for cut bait or chum. Avoid using bait tank chemicals in your tank. With the proper flow of new water in and old water out they are unnecessary and a waste of money. Remember you are going fishing not taking chemistry 101.